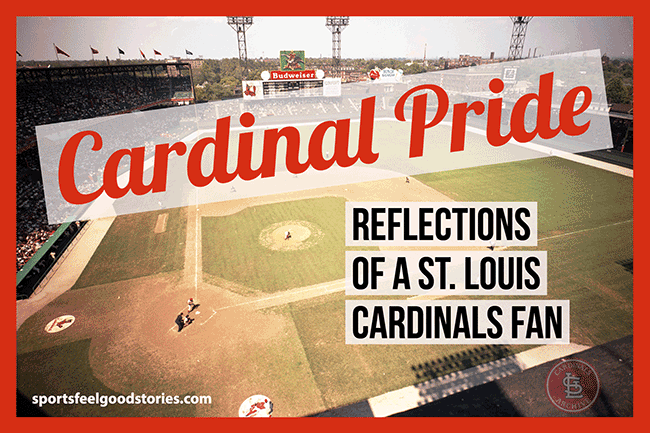 On a sweltering summer day in 1960, my father parked our family station wagon and led my mother, my sisters, and me through the front gates of Sportsman’s Park, then the hallowed home of the St. Louis Cardinals. I knew the Cardinals line-up from top to bottom, but through all the pre-game commotion I kept my eyes glued for a sighting of my baseball hero, Number 6, Stan “The Man” Musial. Stan Musial: who never wore a batting helmet. Musial: who’d never been ejected from a game for arguing with an umpire. 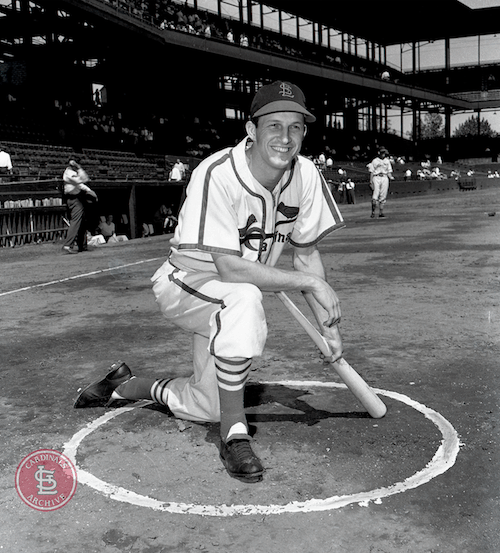 Stan Musial: who in his 22 big league seasons would collect almost 3,700 hits and retire with a lifetime average of .331 – compiling exactly the same .331 average playing in St. Louis and on the road in other Major League parks. I wish I could remember the game that day. It’s simply too long ago. 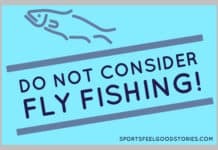 I do remember that my father bought me a scorecard for 5 cents and patiently taught me the art of keeping score play-by-play. It was a practice I followed faithfully for decades at every baseball game I attended, until I had children of my own and was too distracted by dropped ice cream cones, sticky cotton candy hands, and trips to the bathroom. 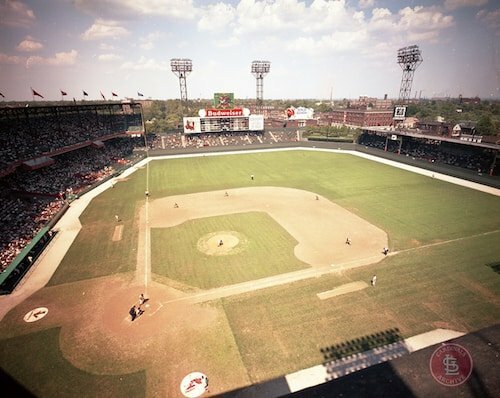 In retrospect, though, I also know that my love affair with baseball –and especially Cardinals baseball – began in earnest on that hot summer day at Sportsman’s Park. It is now more than 40 years since I moved far away from my boyhood hometown. Still, the significance of baseball and my love of the Cardinals are like rich, red threads woven through the fabric of my life. During times in my life when my father and I had little else in common, the Cardinals were always a safe and comforting topic of conversation. When business travel took me to unfamiliar cities, I’d often make my way to the ballpark, buy a ticket on the street, and settle into a bleacher seat where everything and everyone around me felt like home. During each baseball season, my family joked that I would walk outside to get the morning paper and bypass all of the major headlines to first learn what the Cardinals had done the night before. And during the off-seasons, I took a page from Hall Of Fame Cardinals shortstop Rogers Hornsby, who when asked what he did in the winter when there was no baseball, said simply, “I look out the window and I wait for Spring.” I do the same, waiting for Opening Day each year like a child waiting for the first day of summer vacation. I realize that many baseball fans feel the same way about their team as I do about the St. Louis Cardinals. However, it must be said that being a lifelong St. Louis Cardinals fan has been exceptionally easy duty. However, it must be said that being a lifelong St. Louis Cardinals fan has been exceptionally easy duty. Despite being a smaller-market team, the Cardinals consistently find a way to win, holding more World Series championships than any other Major League team with the exception of the New York Yankees. Whether they’re at the top of their Division or only playing .500 baseball, year in and year out more than 3 million fans fill the seats at Busch Stadium and countless more enjoy the game from the “Cardinal Nation” complex across the street. 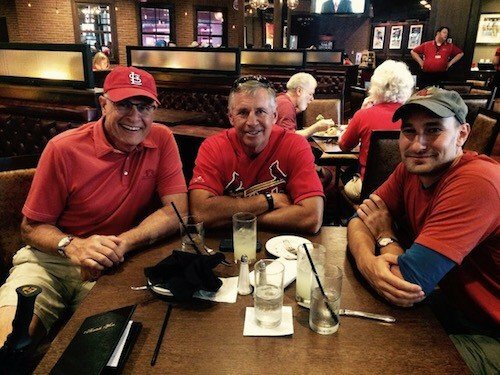 Everyone back home is a fan – with Cardinals hats, jerseys, and bumper stickers visible everywhere – and during a game one can stop into almost any place of business and someone will happily call out the score for you. There’s a level of fan engagement with Cardinal baseball that friends in my adopted city have never known. And sitting in Busch Stadium last summer to watch my brother throw out the first pitch at an evening Cardinals game (a perfect strike, let it be said). In families like ours, a love of baseball is passed down from generation to generation, almost like a religion. My father, who introduced me to the game, has his own commemorative brick on the walkway outside Busch Stadium in St. Louis. In turn, each of my adult children has inherited a love of the game and is a St. Louis Cardinals fan. On a recent weekend, my two grown sons and I traded texts from 3 ballparks; one of us from Target Field in Minneapolis, another from Miller Park in Milwaukee, and a third from Rogers Centre in Toronto. We are a baseball family. The game has changed a lot over the years, good in some ways and not so good in others. A Bob Gibson complete game in the 1960s would routinely take 2 hours or less to complete. I’ve been to seven games so far this season and the game is often in the fifth inning at the 2-hour mark. All the emphasis on home runs, exit velocity, and OPS has made a joke of batting averages and strikeout rates. And, the fan experience seems to rely more on digital noisemaking and distraction than on the game itself. Ah, well, it’s still a night at the ballpark. Perhaps we’ll see each other there sometime. I’ll be the old guy with a pencil behind his ear, huddled over his scorecard, watching every pitch and anticipating every play, doing his best to tune out the Kiss Cam and the between-innings contests on the jumbotron. Oh, and I’ll likely be wearing a St. Louis Cardinals jersey with a big red “6” on the back with the name “Musial” printed above it. I’ve had it awhile now. Richard is a health care consultant who has lived in Minneapolis, Minnesota since 1977. When he’s not following the Cardinals or planning his next trip to Busch Stadium, he can often be found at Target Field cheering on his adopted team in the American League, the Minnesota Twins.